It takes great time, hard-work and tons of smart efforts to get the graduation degree! By becoming a graduate one just raises its knowledge and life-based experiences to next level! It is truly a great bliss for everyone to receive the graduation degree in his/her hand finally after completing the 14 years of education! It is in trends now that the family organizes the special congratulatory parties to double up the happiness of those newly became graduates or just for a super warm welcome to them! Choosing a particular graduation party theme and decors is the very thing to think about to make the party celebrations unforgettable! 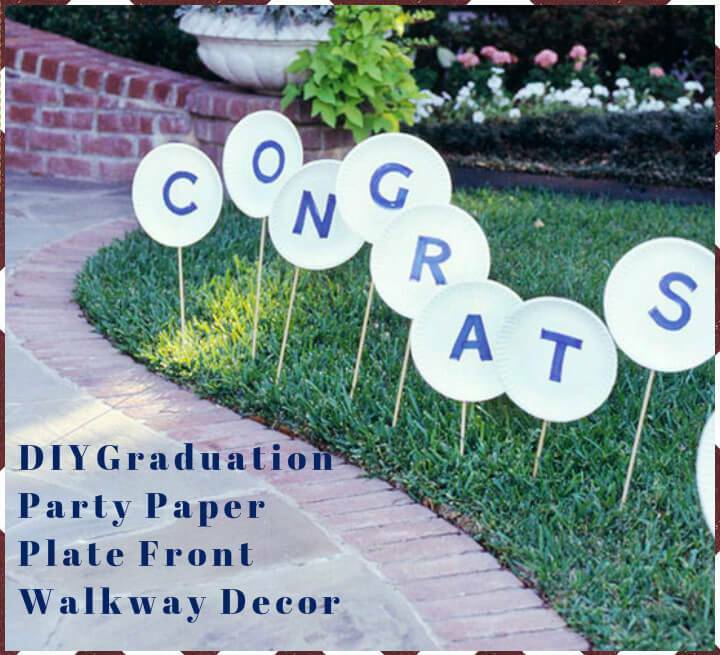 To assist you in this matter of great happiness, we have brought these 50+ DIY graduation party ideas for decorations and theme that will summarize all the popular modern, vintage and retro graduation party themes and decors! 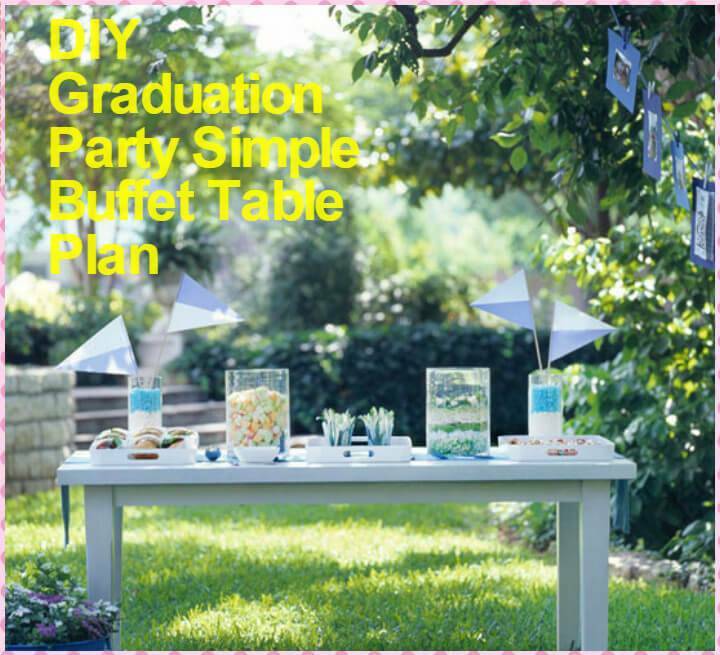 Moreover, these ideas will also throw a great light that how you can create cheaply your own beautiful dessert tables, party buffet tables and how you can decorate the party foods and apparatus to tell a little about the graduation party! A bundle of insanely smart ideas about to how to raise your party fun to the peak has also been included in the list! For example, you can add special photo booths to your party with special fun-making props, you can also include some fun games to keep busy your guest, friends, and family members in enjoying the party! There also come a great list of DIY decor ideas in this collection that will make you learn that how you can turn ordinary home materials to special party-ware or party centerpieces to keep the party going on a budget-friendly plan! 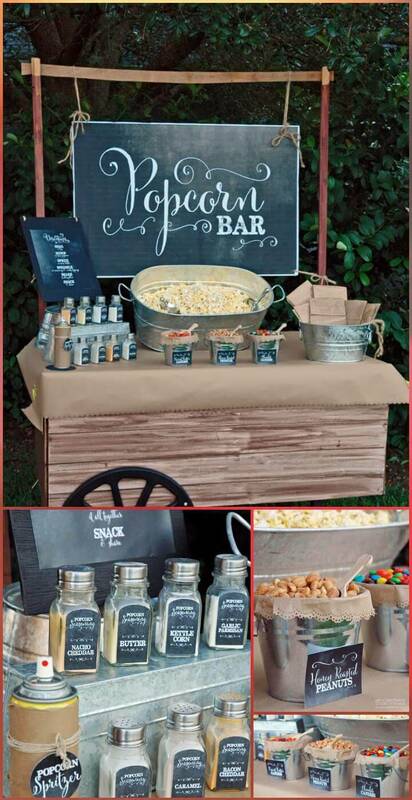 Like you can build your own special party beverage station by using some metal pipes and buckets, you can repurpose the glassy jars from home to make special party drinks, memory jars and lots of other enjoyable things, check out some amazing samples below! 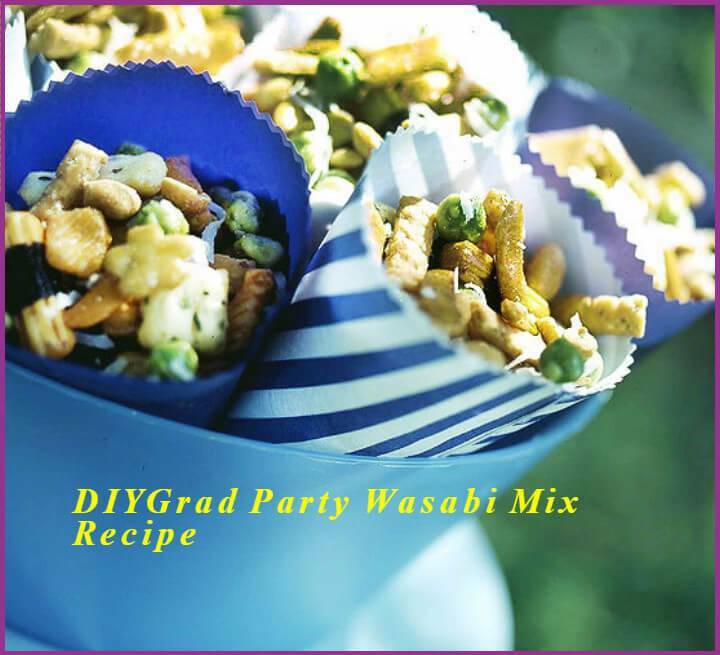 Some delicious party food recipes have also been included in the list to make you easily cook the delicious party food at home with amazing details of graduation party theme, soft pretzel graduation hat, grad hat topped butter cakes and cocoa Krispies treat graduation that are a beautiful example in this case! 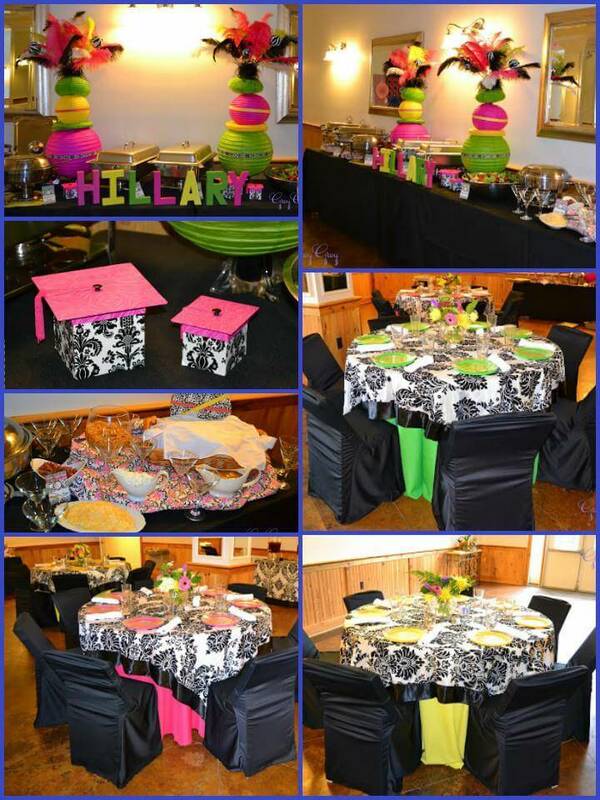 The ideas will also speak volumes that how to make special party decors! 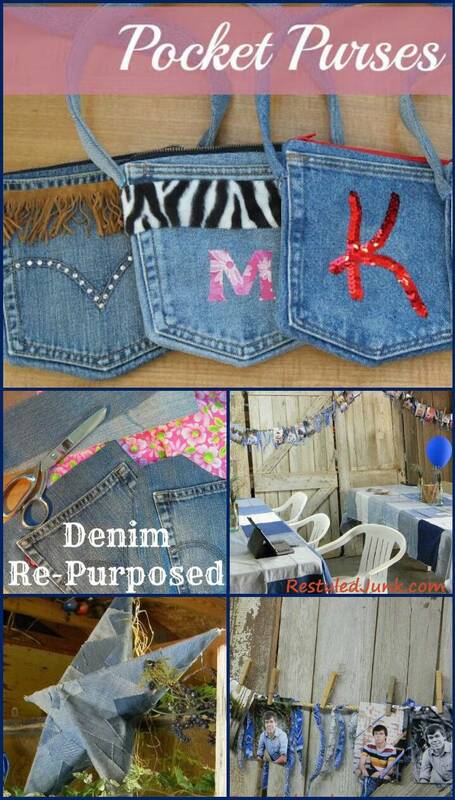 Recycle your old denim jeans and turn then in to special party decors! 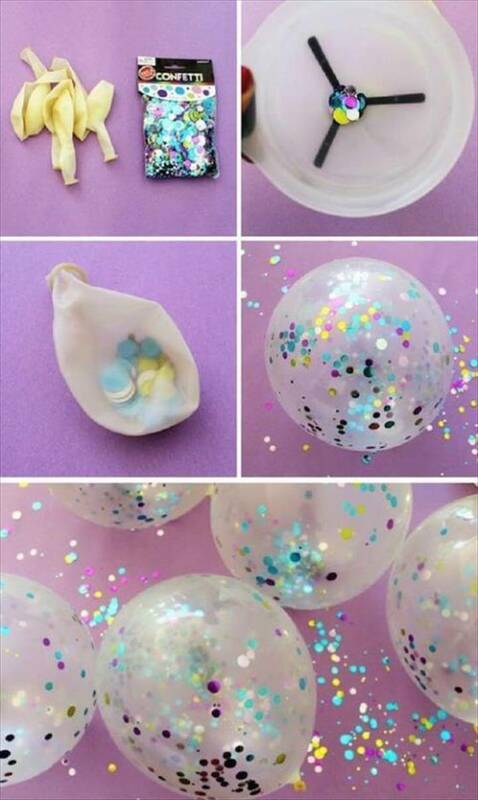 Design your own beautiful printable toppers at home and also make your own eye-popping confetti balloons to fancy up the party environment. Use a bundle of tissue folds and put them together to write custom name letters for party centerpieces. And also design your mind-blowing advice trees by using some printed cardboard pieces, old tree branches and some old home glass jar. 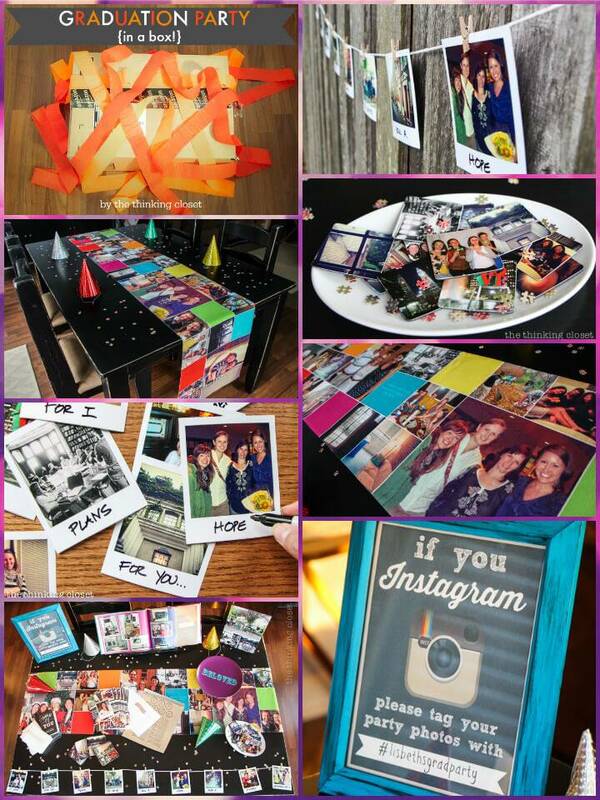 Learn also amazing DIY ways here to make amazing photo collages, photo portrait and commemorative wreaths for your graduation party! 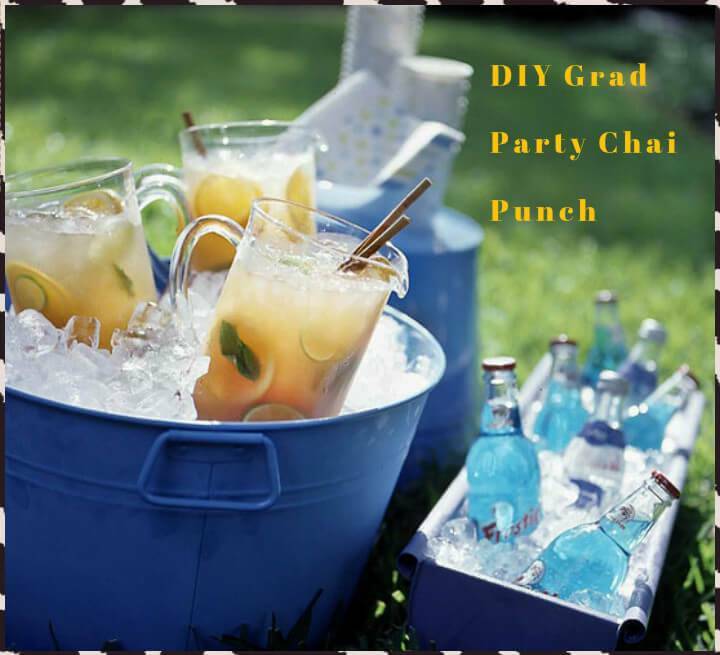 A short round up is must to see how smart and clever these DIY graduation party ideas are! So, just go for it!! If you are looking for a unique and absolute fun theme for your graduation celebration then have a look at this rocking Pirate theme party with you and your friends dressed up as pirates, a cute little ship around and the rest of the decor co-ordinates to the theme as well. To know details just click on this link and enjoy pictorial guidance yourhomebasedmom! 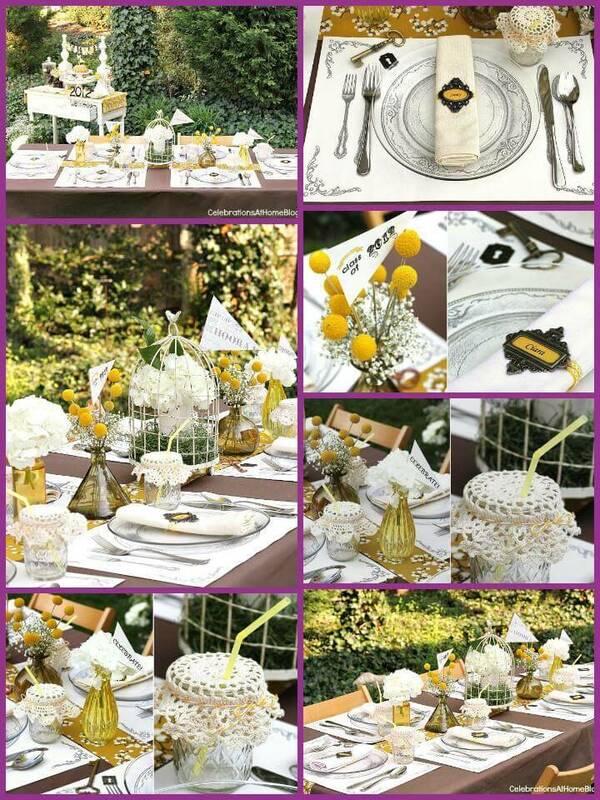 For girl’s graduation party i think nothing can be more fun, gorgeous and classy than this Daisy theme party with gentle white, yellow and green colored shaded to all the party items from decor to cake and desserts. To know more of this soft and subtle chic party you need to browse this link for every single detail and help ohmy-creative! 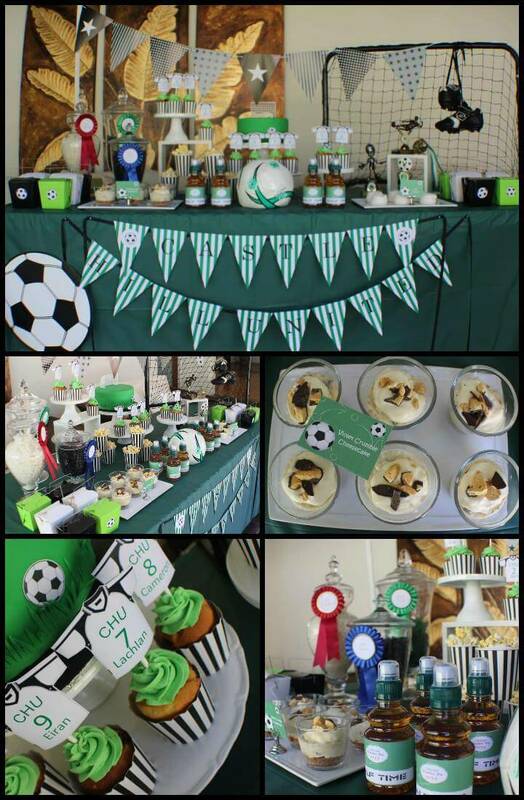 As the above Daisy theme is for girls boys can adapt this fun Football theme party to to enjoy before entering to the practical life. From the table decor, banners, dessert tops, and tags all have been planned and made in accordance to theme to let you all drool over it. catch the whole tutorial right here catchmyparty! 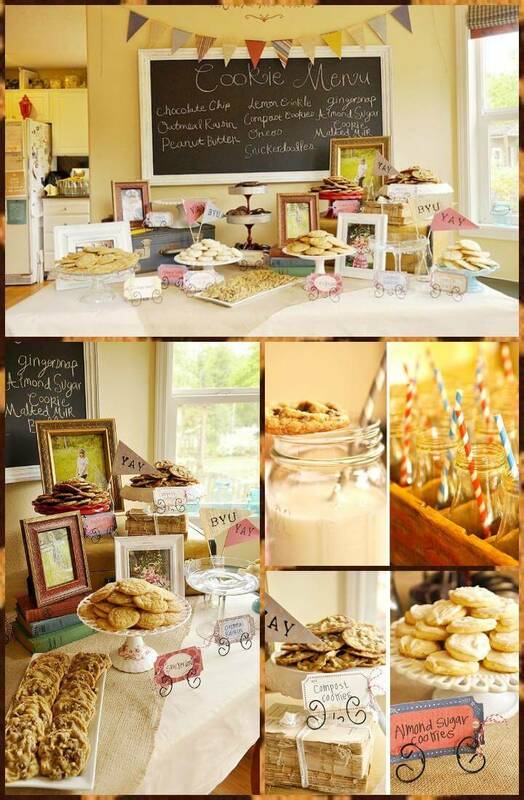 How about saying good bye to your high school in a sweet and sugary way with this Cookie theme party. You would need lots of yummy cookies that you can bake at home if you have baking talent to serve with milk. 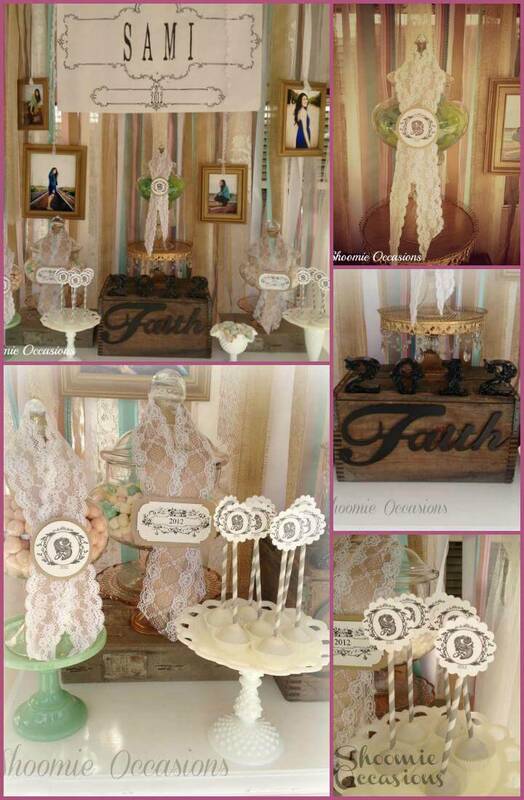 For decor, table setting and more details you can approach this link for a complete overview of this cookie theme party love-the-day! 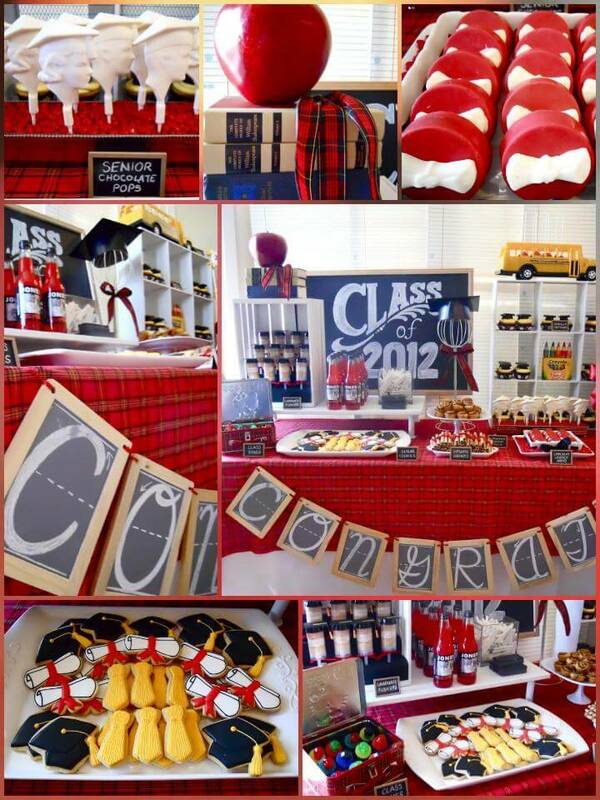 Your eyes would pop out with amazement after watching this wonderful graduation party theme. Mouth watering menu, breath taking decor and table setting, scrumptious desserts, eye catching colors in short each and everything in this is just ingeniously created and crafted so if you want to get this style of graduation party get the complete information, detail and ideas right here partypinching! 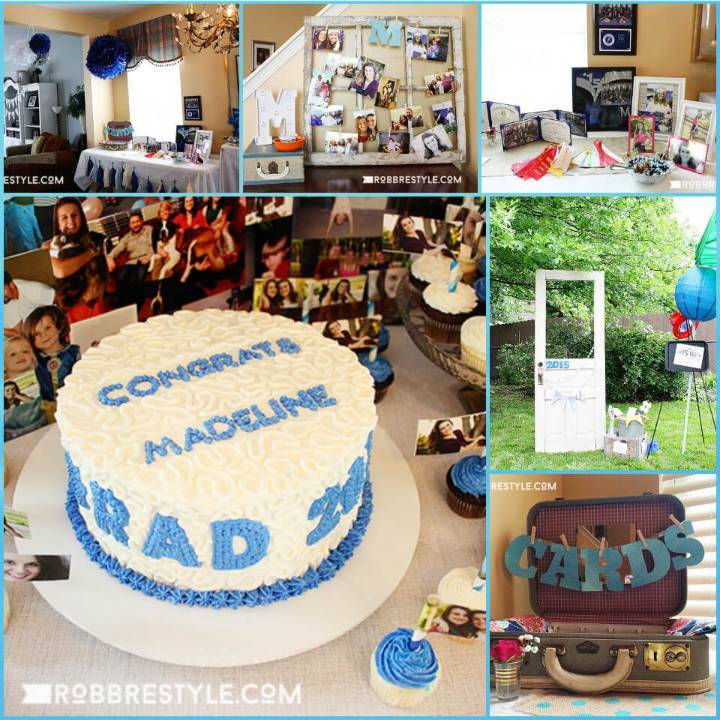 what can be the best idea to praise the hard work of the graduate of your family than surprising him or her with a fun bash graduation party. 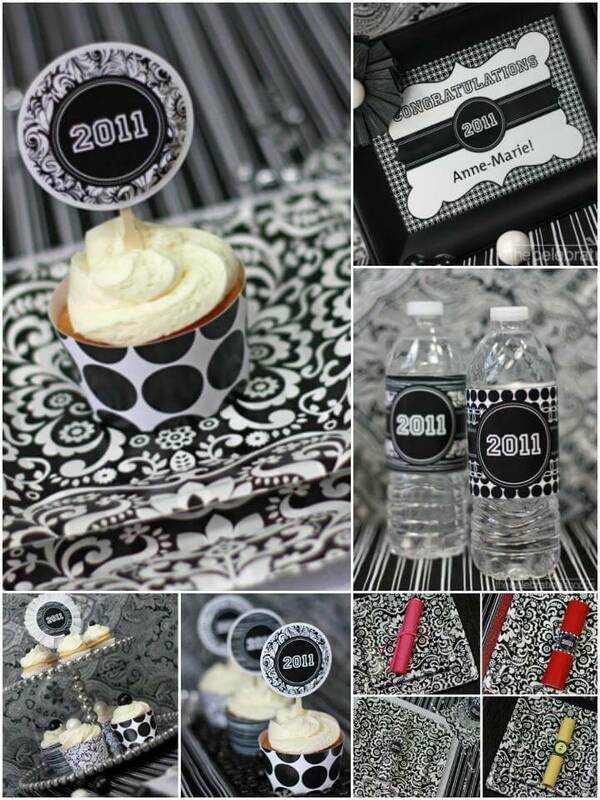 Try this Black and White theme for decor, party menu and even for the small details like napkins, beverage printers, toppings and let every body in the party appreciate your crafting and creative skills. want to need more details of it? just browse it thecelebrationshoppe! 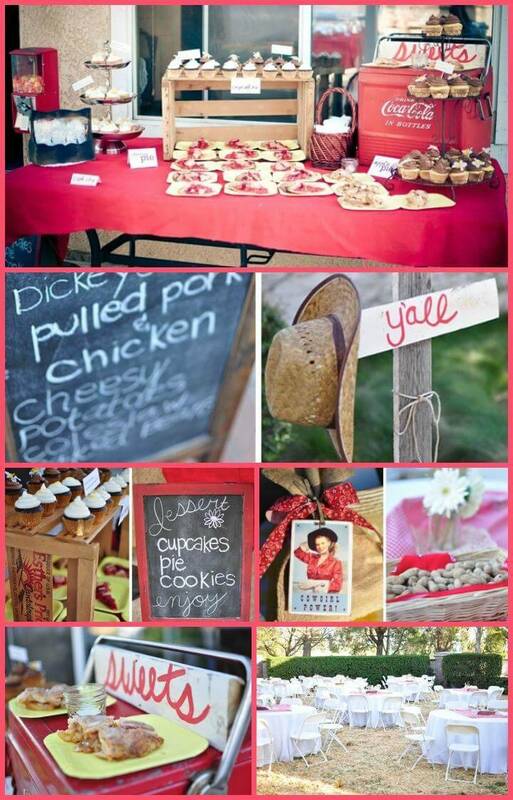 Not only the yummy food but let your graduation party guests also feast their eyes with the decor of the party too with this simple and shabby chic styled western themed party idea. This theme shows how you can make even the toppings, tags, menu signs and even the handouts so special and worth remembering. Get all the fun details with this link love-the-day! 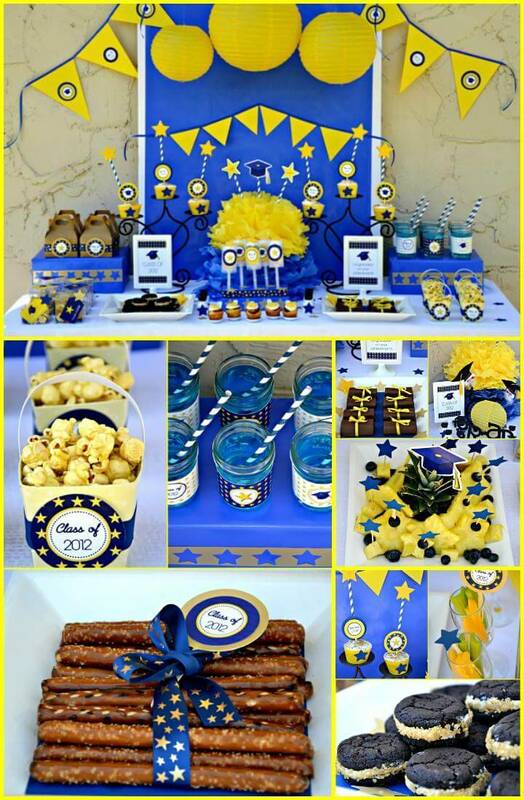 I do not know i got minions in my mind when had the first look over this zealous graduation theme party. 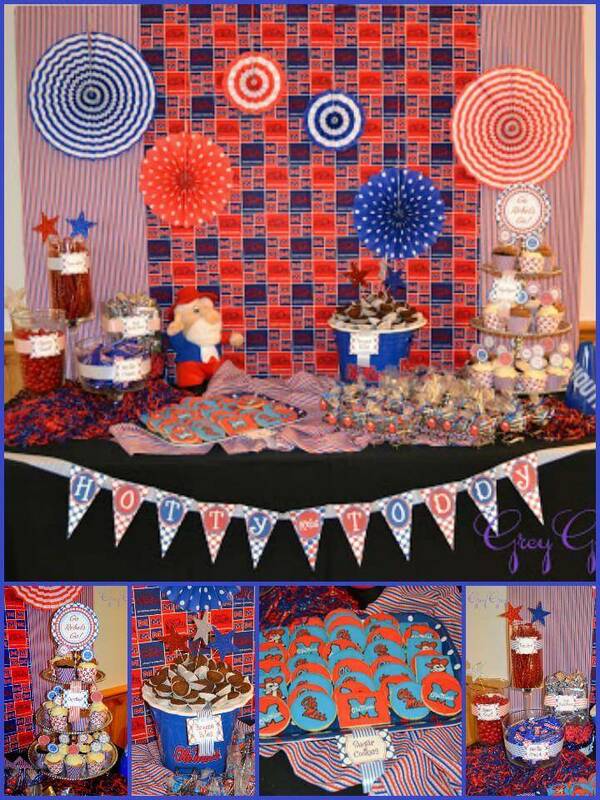 And let me tell you the vibrant colors shades, adorable toppings and stirrers, banners, wrap up ribbons all make this party decor no less cuter than the minions.Explore more of this fun party decor and theme right here crissyscrafts! Pink color gives us quick hint that its for Girls.Yes This pink and gold theme party has been styled and designed for the girls who have successfully got their graduation degree. From decor, cake, cup cakes, frames and signs every things looks superb in pink and gold glitter.And not only for graduation celebration this exquisite color theme can be hacked for any event in your family like a baby shower.All the details are present here peartreegreetings! 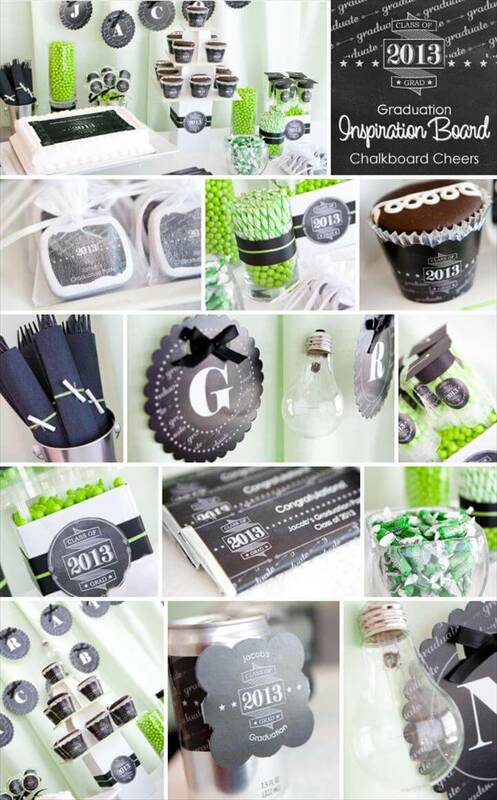 Easily available things like chalk boards and bulbs have been used to organize this superb black and white theme party for the fresh graduate of your house or family. The passing year signs, napkins, cup cakes all look just outstanding getting in accordance with this chic theme having all particular features in this link bigdotofhappiness! 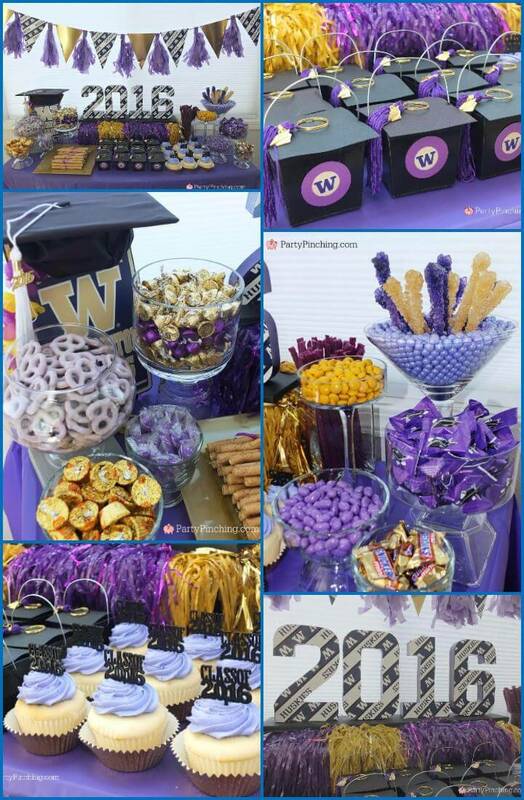 Anyone attending this fun graduation party can not resist himself to utter the word WOW after watching so gorgeous and colorfully excited decor and table setting. To adopt this theme and design of the party you have to do some shopping to buy those lovely miss ole printables and the rest of the information is right here so click and enjoy greygreydesigns! Want to how would it look if you combine the black and white and the spring color theme together? the answer lies in above pictures showing fabulous decor and theme for your grad and his/her friends. From the paper lanterns and the utterly cute grad boxes this theme is just is out standing and would be fun to do.To get some extra details and features of this theme just browse this link greygreydesigns! A simple chevron pattern can the the lovely theme of your party for the decor and set up and the proof lies in above pictures. 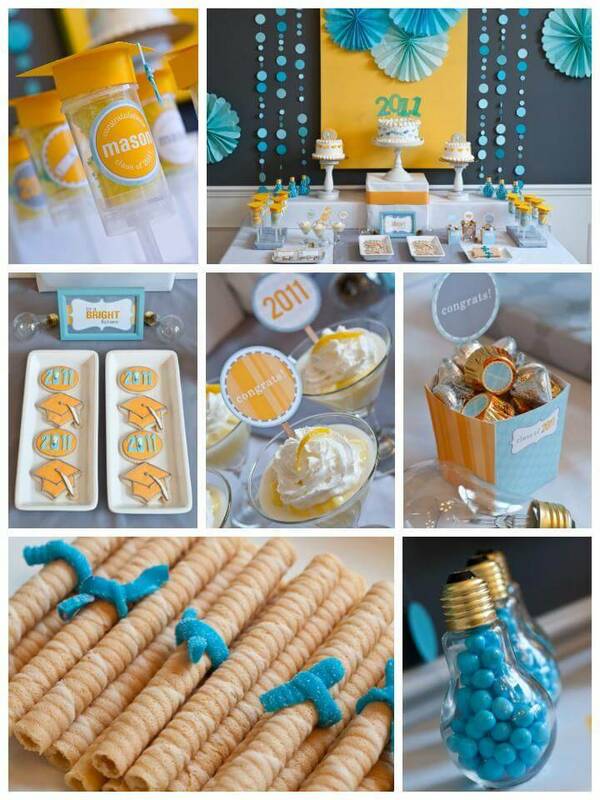 From beverage tags, straws, menu cards to cakes and cup cake toppings everything looks super awesome with the chevron pattern on it in lovely yellow and navy colors. The detailed view of this chevron theme party is available here on hwtm so do browse if you want to go handy with this fun theme. You have to consider the likes and favorites of your grad before throwing a graduate celebration party for him and his gang. 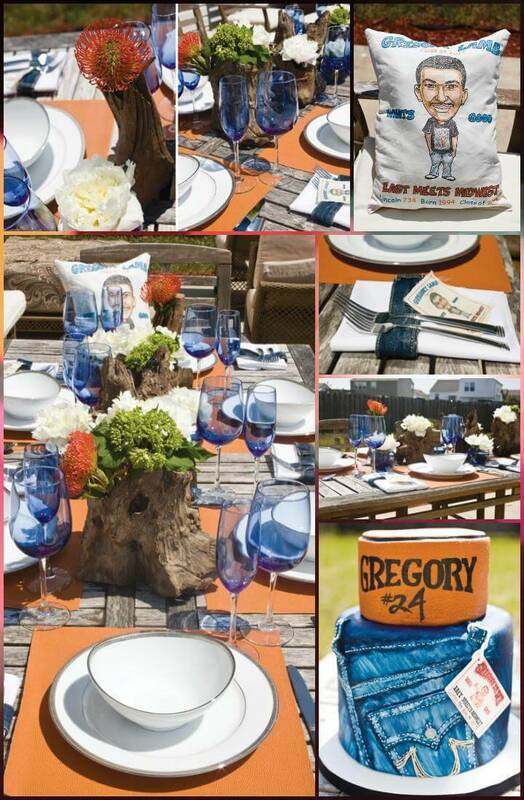 and if you grad is in love with jeans and basketball then this denim and basketball theme is just perfect to follow and go handy with for decor, table setting, tags and even the cake expand more of this innovative theme on this link hwtm! If you are planning to arrange a blast graduation success party for your physical education grad then this party theme is just apt for you to work upon. The basket ball base is dominant in this decor and arrangement style with lots of more fun items like the graduate cup cakes and diploma wafers.thenymelrosefamily! To hack this absolutely fun graduate theme you don’t have to put stress on your brain as all the inspiration for it comes from school like the school bus, crayons and the chalkboards adding more life to it being used as menu cards, congrats banner and much more. To know the more exciting details just visit here for once ohsugareventplanning! 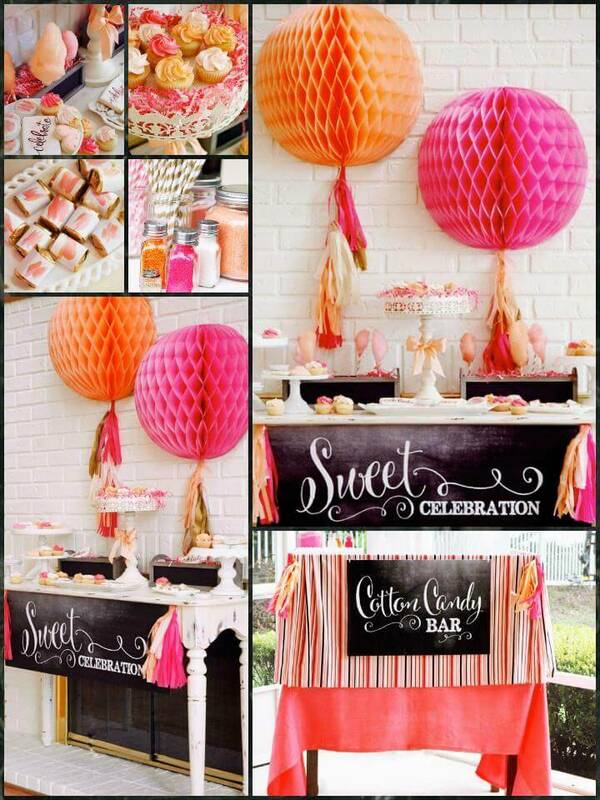 Orange, pink and golden color theme party would instantly win the hearts of your grad girls as it turned out so well with the table decor, desserts and most importantly the candy bar adding more fun and excitement to the celebrations.To peak into the features of this lovely theme more precisely just expplore this link and enjoy pnpflowersinc! This specific Pretzel idea can be a part of your food chart at a grad party and it looks so tempting with that perfect graduate cap shape.To know the whole recipe and method of making these graduate cap pretzel browse this link and enjoy hungryhappenings! 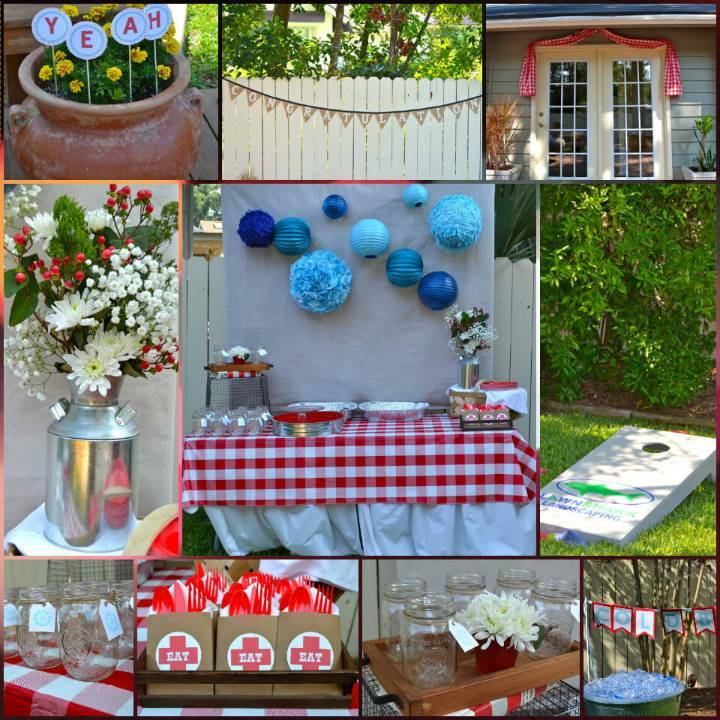 These pleasant looking grad party decor ideas are not only fun looking but also a huge a fun to make bringing out the crafty skills of yours.The icing on the cake is the you need the cheap and easy to find things to shape them all like a Terra cota pot, fish bowl, empty mason jar etc get access to these ideas more properly and precisely over here yesterdayontuesday! The graduation party are not about fun and enjoyment they are also held to to advise the fresh grad some nice pieces of advice too which would help him to go strong in his practical life ahead. 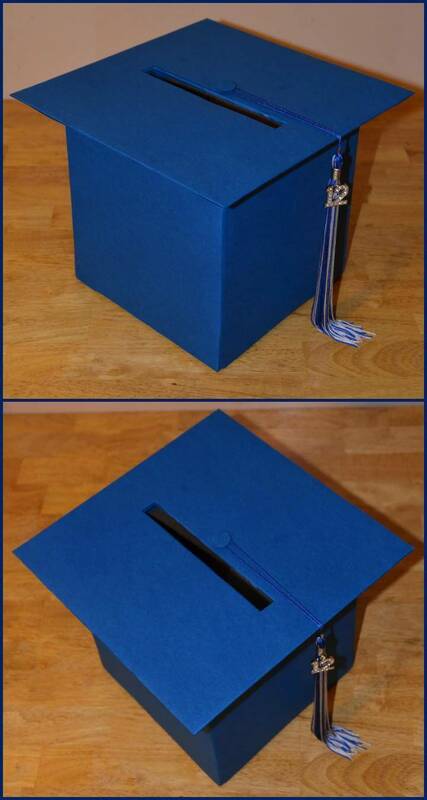 So make this graduate advice tree for your grad with printed cards to write advises on and clip it to the tree.This superb idea has come from this link so do browse it to get more of it playpartyplan! 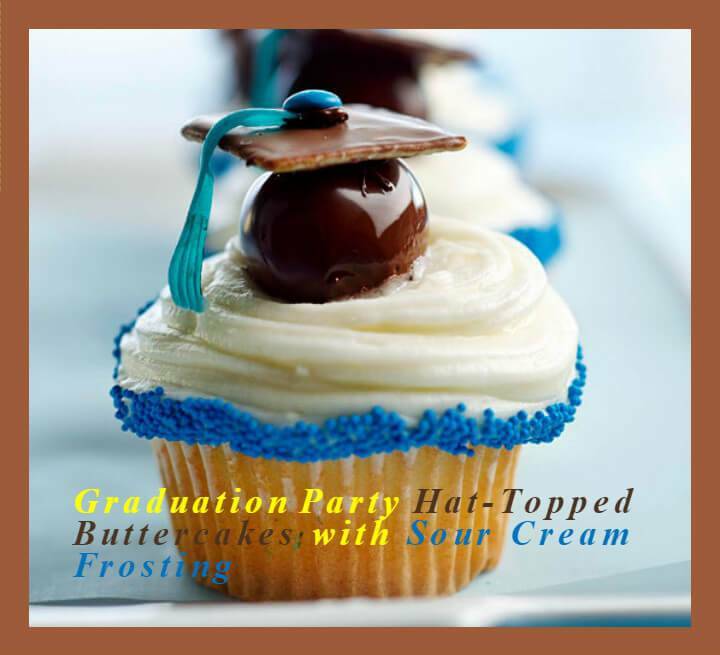 Try something new with the dessert to be unique with the graduation party ending and this yummy chocolate cake idea in the shape of graduate cap is best to try your hands on. I am sure fell in love with this idea so grab some details here hungryhappenings! It takes a lot of time and struggle to turn out a graduate and this definitely calls for a celebration. Celebrations means party and with party comes decor and no decor is complete with a center piece. So this fabulous GRAD lettered piece is a great idea to try your crafty tools on made up and covered so amazingly with photos. 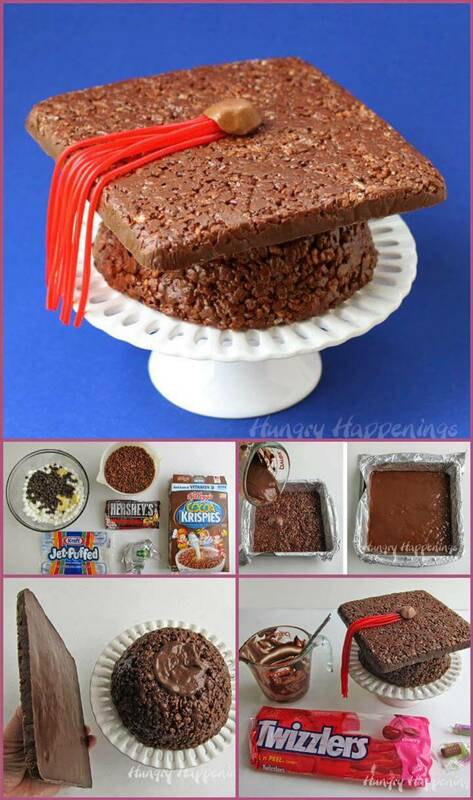 Check step by step method right here michellespartyplanit! Take out the old denims from your closet as they can be of so much help and fun for the decoration of your party that you are planning to delight the fresh Grad of your house. From table covers, banner ribbons and decor center pieces you can do it all with the denims and watch the complete overview here finecraftguild! This is the best decor idea one can ever come across for the graduation party of his or her son. Its a lovely picture wreath showing the pictures of the Grad from birth to the present and gaining not only decorous but so much emotional value. Catch all the details of this picture wreath project by clicking on this link diybeautify! 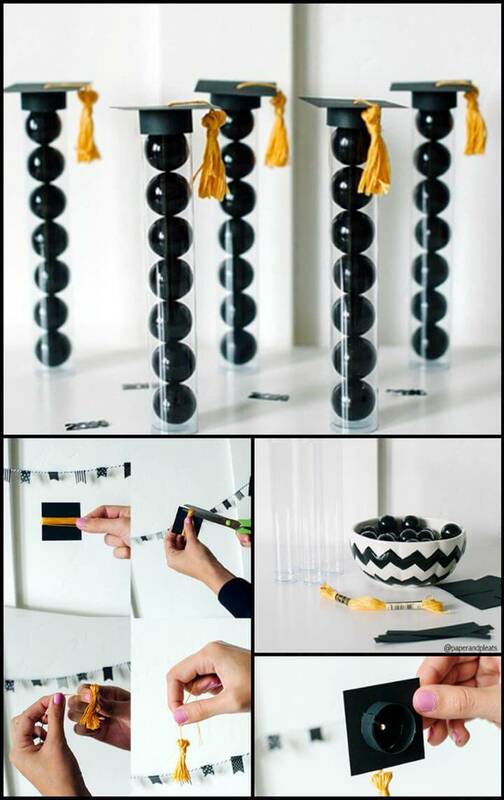 Make the day graduation completion and unforgettable day in the live of your son, daughter, sister or brother with some fancy decor and fun embellishment like shown in the above collage of the photos. From banner to water bottles and napkin pockets all have been made to look quite fun and exquisite here so you can do seeking picture by picture detail of feature from this web spot mossandmint! Your cute little kid who has got promotion from the kindergarten surely deserves a treat or some fun celebration and these banana pops are just utterly delicious and totally fun to look at too so try them out and your little one would drool over this sweet surprise.It does not require a specific recipe but still you would enough aid from here bakersroyale!